I am probably not the only one who felt a little tear sting their eye when the news broke that Robin Gibb was on his deathbed. There probably aren't many of us, young or old, who haven't at some point in our lives enjoyed the wonderful music of the BeeGees. How utterly delightful it is to now know that Robin Gibb has come out of his coma and is speaking to his family again. The BeeGee brothers have been struck by some awful tragedies in their lives - how lovely it would be if Robin and Barry could lightened our lives with a little bit more of their very special brand of music for a few years longer. Poor Robin is facing some serious challenges though with bowel cancer, liver failure and pneumonia. But he's already faced survived against the odds - let's hope he can make the distance. A man walks into a collector's shop wanting to sell his collection of old albums. The shopkeeper recognises him and after exchanging pleasantries he agrees to buy the record collection for a few pounds. Later, as the shopkeeper sorts through them he sees Barbra Streisand's Guilty album. He's a big fan of Barbra so he pulls it out of the cardboard box and as he inspects it he sees a cryptic message written under the album title. What might happen next? Does anyone want to offer up a cryptic message to get the old creative cells working further? I always find a little bit of input from others can be quite stimulating. So, if you got an idea for me let's be having it! I might even send this scenario to a writing buddy and see what he makes of it too. The more the merrier! 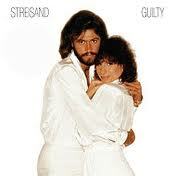 In the meantime, here's Barry and Barbra singing Guilty. Having watched the video below a number of times I think my favourite excerpt is not Barry arriving on stage halfway through the song or Barbra's kooky faces but the close up of the three adults in the audience so obviously enjoying the performance with smiles on their faces and in their eyes. The woman looks like a young Elizabeth Taylor too - although I don't think it is her. Isn't it great to see people looking happy and enjoying themselves? You could make it a reference to one of the track titles. I like that first idea, Mrs A. The second idea is a possibility too. I've just looked at the track titles and they're fairly simple so I think some word play would be quite easy - maybe too easy for the second task but definitely something to think about re the first idea.